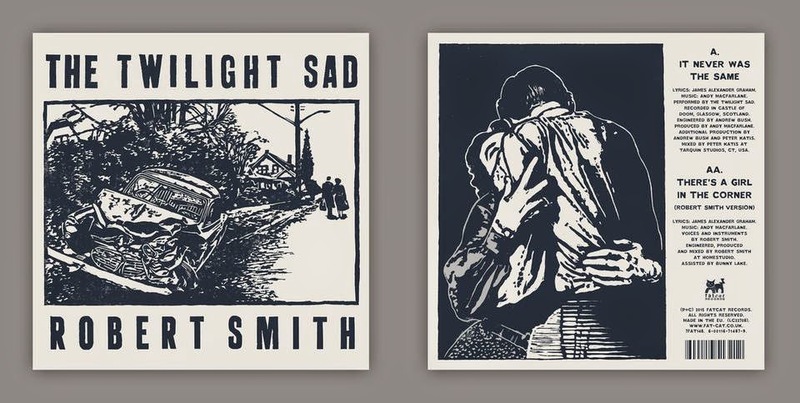 The Twilight Sad are one of those bands that feel like the soundtrack to some of the most heart wrenching moments of desperation in life—evoking a feeling not unlike what someone would get from listening to The Cure’s Faith. The track ‘It Never Was The Same’ (above), which comes out on June 15th, is a primary example of this. It's good to hear Robert singing again! This is nice to bridge the gap until new Cure stuff will appear. According to the latest reports, Robert's share of the proceeds from the single will be donated to Amaze. The release date has been changed to 30.6.2015. Hi People, i want to buy this on physical cd but cant find it anywhere or even an indication it will be. i did find it 1 place that sold it in WAV format. i will probably just buy that. My real issue is i want to buy other Robert Smith 'projects' like: very good advice, da hype and perfect blue sky on cd but all i see for options are MP3 downloads. i would actually prefer to 'buy' just the song and download in WAV and then compile them myself but cant find a place that offers WAV. - were all these songs released in MP3 (except for V.G.A.)? if that were the case then if i was sold one in WAV format, then that means they would have had to convert it first making it even worse selling a false WAV product. my thought as of now (pre-purchace) is buy his hard to find ''collaborations'' in as high of MP3 as possible, keep them in that format for my walkman, and convert them once to cd (to have them on cd) and call it good enough. i really like his solo stuff (especially his voice which i think sounds better than ever) and want these singles. i dont mind spending even $2 per song if in WAV, but i dont really want to spend $50-$100 for a handful of songs that are on price gouged hard to get cds - of which i cant find anyway. Update (06/11/15): From The Twilight Sad on Facebook - "Unfortunately, due to issues at the manufacturing plant, we're sorry to say the 7” of ‘It Never Was The Same’ / ‘There’s A Girl In The Corner’ (RS cover) has been delayed. Thank you if you have already pre-ordered, it means a lot, and we hope you enjoy the single when it arrives." Hi People, i want to buy this on physical cd but cant find it anywhere or even an indication it will be. Update (06/15/15): The digital version of the single is now available at Amazon (US / UK), iTunes (US / UK), and most of the usual places. why only vinyl and digital only? i understand the appeal of vinyl with the ''warmth'' and all.... but how many people even have a player? lets say i got the vinyl, how would i convert that to play on my digital devices or cd player? so frustrating. why only vinyl and digital only? As for the other RS solo/guesting stuff you're looking for, try your luck on Ebay or something. Smiths version of 'there's a girl in the corner' available in WAV now. make sure to change the format to 'WAV' before you buy. ($1.78) i also bought the Tsad version as well. i checked out the site, they all seem to be over seas plus shipping. Do you check Ebay from time to time? ... i doubt he will put out a ''collaborations'' disk like sinade o'connor did. If he did, it would be quite a headache with all the different labels these collaborations were released on.